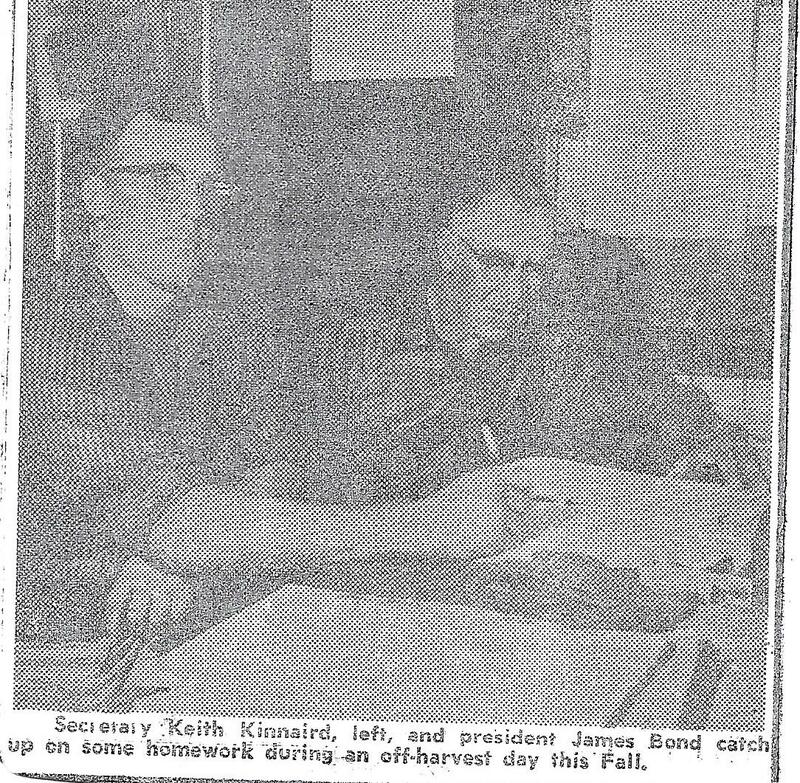 On taking another look through scrapbooks complied by Fred Bowering that are in the Reston Library (see the previous about them post here ), I found a clipping from the 1963 Manitoba Co-operator about the beginning of the Hargrave Cooperative Elevator Association No 81 that has a family connection. The postcard picture at the top of the post was among things from my Grandma Kinnaird's trunk and it was interesting to learn the story behind it. Binding Our Districts history book written in 1989 helped me fill in a few details too. The first grain elevators were built in Hargrave in the 1890's. Ted Holmes built a private elevator and ran it until a tragic fire claimed his life along with 2 others and destroyed his elevator in 1903. The Northern was a red painted elevator that burned in the same fire. McLaughlin & Ellis ran a black painted elevator but farmers felt they charged too high shipping costs and their dockage for weed seeds in the grain was often inflated. Wheat prices had collapsed in the 1920's and farmers were looking to maximize their profits. Platform loading was possible onto producer cars where farmers pulled alongside a rail car and shoveled their grain in but it was back breaking work and they had to work fast to have it loaded in time. On April 12, 1928, 46 men met to discuss the possibility of building their own Cooperative Elevator on the former site of the Northern. My grandfather Frank Kinnaird, Great Grandfather Alexander Milne and Great Uncle J.J. O'Neil were among those men. Ten thousand acres needed to be signed up for the project to go ahead and this was soon done and the project was a go. They decided the building would be built and equipped with nothing but the best including a five unit cleaner, electric lights and generator. This article boasts there were only 2 years where the elevator's revenue did not meet the operating costs even through the dry thirties. An agent's cottage was also included and the final total cost was $22 851. In October of 1928, P.J. McDonald was hired as manager and helped to make it a successful venture. Later managers were men named Morrison, Shilson and Cullen. Albert Cullen was succeeded after 35 years on the job as manager by Don Leadbetter. In a full circle moment, Don just happens to be the son-in-law of Fred Bowering ,the man who compiled the scrapbook of clippings! Alex Milne served as president of the Co-operative for a time and J.J. O'Neil was the first vice president and later president. 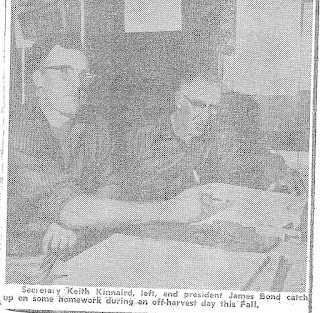 At the time of the article that was found in the scrapbook, my uncle Keith Kinnaird was secretary. The Hargrave history book confirms he held this position until 1979 when the elevator was traded to become a part of United Grain Growers property. 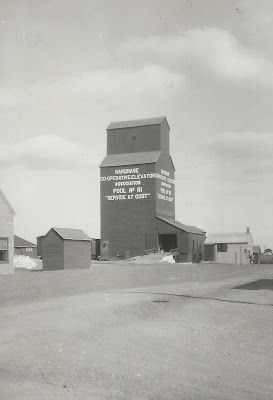 The Manitoba Historical Society has undertaken a project to catalog all past and present grain elevators in Manitoba and you can read more about it here. The page about this elevator now includes the Kinnaird postcard picture from 1946 here. The cooperative movement of farmers in rural western Canada has an important history as well and one that led to the success of my ancestor's farming endeavours.